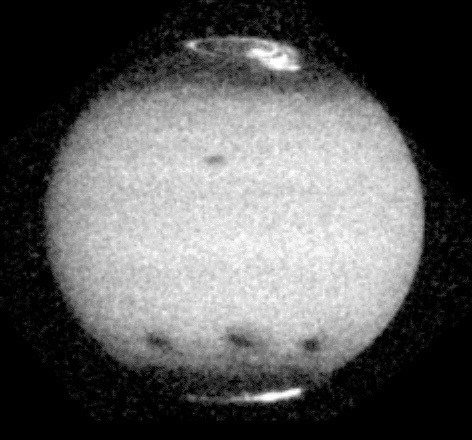 This image shows the aftermath of comet P/Shoemaker-Levy 9's impact with Jupiter. The impact sites of fragments C, A and E are visible on the southern hemisphere, from left to right and this image was taken about 12, 23, and 4 hours after each collision. Jupiter's satellite 10 is seen crossing above the center of the disk, and the famous Great Red Spot is near the eastern limb.